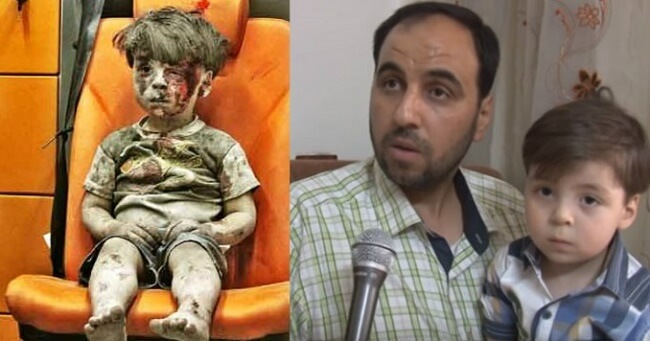 The boy's dad, Mohammed Daqneesh, says Omran had “minor injuries” and did not actually have to go to the hospital. The blood smeared across the little boy's face actually came from his dad's wound that dripped on him. Mohammed explained that after he took Omran to a safe location, so that he could look for the rest of his family, someone took his little boy and began taking photos of him. He noted that, “They filmed him before providing first aid.” Granted this is still a horrible traumatic experience for the little boy, it is clear that this entire episode was manipulated. So will the mainstream media admit the Truth? I highly doubt it for obvious reasons, but if they do, they will almost certainly play it down or distort it. It should be said that this article is not about siding with one government over another — since the common people throughout the world are being exploited collectively by different governments on different levels. No, this article is about exposing propaganda and the fact that this type of manipulation should be made known to everyone. Of course, people who have been completely indoctrinated by Western propaganda would like to make the claim that the boy's father is being forced to say these things, and maybe that is a possibility. But why is it that so many Syrians are saying similar things? See HERE, HERE, HERE, and HERE. Have we really descended into such a shameful existence of ignorance that we cannot see the trend of lies and propaganda, followed by death, destruction, and chaos that follows these Western interventions? Why is it that this little boy got more media attention when he was used to lay blame on the Assad regime, than the little boy who was beheaded by Western backed “rebels”? Did we not learn anything from Libya, just a few years ago? The country enjoyed the highest standard of living in all of Africa under Qaddafi, and after being completely destroyed over lies about how evil he was, the country is now a failed state that is overrun by radical Islamic fighters which the West helped put there in the first place. Do people seriously not see what the hell is going on here? In other words, even in the unlikely possibility that this man is being forced to say these things, history shows the Western establishment cannot be trusted, compulsively lies, spreads outlandish propaganda, and exports mass murder and destruction in an effort to maintain or spread empire. Why would this time be any different? Please spread this story like wild fire, these lies and half truths need to be exposed.